Another week has passed the world by and there are three more great posts from Westfarthing Woodworks for you to enjoy. First, I’ll continue making the acoustic guitar by trimming the plates. Then, I’ll show you tips for using a wood scraper. 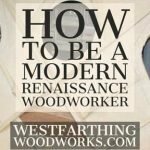 Finally, I’ll introduce you to the Renaissance Woodworker and show you another woodworking gallery. Enjoy. 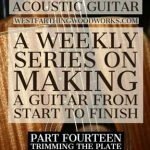 In How to Make an Acoustic Guitar Part Fourteen, I’ll show you how to trim the plate overhang to be flush to the guitar sides. This is an important step, and it squares up your guitar in preparation for routing the rabbet ledges. This is where your guitar body will feel the most like a real guitar so far, and you will find the step fairly easy if you take your time. This can be done by hand, or it can be done with a router and a flush trimming bit. I’ll show you everything you need to know, plus lots of tips and tricks along the way. 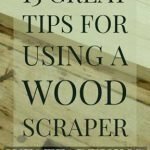 In 13 Great Tips for Using a Wood Scraper, I’ll show you a number (I bet it’s 13) of great tips on using a scraper that will make you better with it. If you have never used a scraper before, you are missing out. These tips can help you get a great start right from the beginning, and skip a lot of the mistakes that myself and others have made as beginners. Before sandpaper, there was the scraper. Not only does it work better in many cases, but it lasts longer and costs less over time. I’ll show you all about it, and you will end up buying one after reading the post. In How to be a Modern Renaissance Woodworker, you will meet the ultimate example of woodworking prowess and skill. They are knowledgeable, intelligent, and skilled at a variety of woodworking tasks. This is a huge goal to strive for, and you can do some things that will help you achieve similar abilities as those who have a lifelong study of a craft. After all, shouldn’t the goal of any hobby to become very good at that hobby? If this interests you, the post will launch you into outer space. There is the first Woodworking Gallery post, with great pictures of fun woodworking projects. These have all been on the site at some point or another, and they are fun to go back through. This will be a weekly thing going forward, and I hope you like seeing all the pictures in one place. If you have any questions about the week in review, please leave a comment and I will be glad to answer them. Happy building.